Medical appliance technicians construct, fit, maintain, and repair braces, artificial limbs, arch supports, and other medical and surgical appliances. No two people are alike. Even identical twins begin to differ slightly with time. It is only fitting, then, that every device made to replace or assist a part of the human body should be different, to match its owner. Prosthetic specialists and other physicians prescribe and order these appliances, but most are made by technicians. These technicians follow the doctor’s orders to mold, bend, sculpt, or cast a personalized appliance for the patient. A medical appliance technician works with a podiatrist, orthotist, prosthetist, or other healthcare professional to create, fit, or polish personalized appliances. 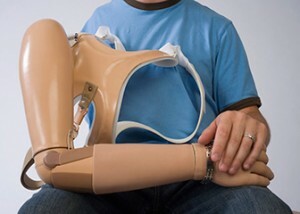 These appliances may include prostheses (replacement limbs or other body parts), braces and supports, or hearing aides. There is an element of craftsmanship involved — the finished products must fit the patient perfectly to function at their best. Technicians must also be able to follow written and/or verbal instructions accurately. Most of their training comes on-the-job, and the longer they work, the more they are typically expected to manage on their own. Only a high school diploma is required to begin work as a medical appliance technician, and students with good a history in art, wood shop, engineering, life sciences, and/or math will do well. Finding a training program at a community college or vocational school is rare, but will increase your entry-level earning potential, as you will be able to operate on your own much more quickly. The American Board for Certification in Orthotics, Prosthetics and Pedorthics (ABC) certifies technicians who pass their exam. This certification is not required, but it is preferred by most employers. Employment is only predicted to grow by 4% in this field, which is well below the national average. However, the median annual salary is $35,670 (as of 2010), which is on par with or above the median salaries for similar careers.